1771-1853. He was the son of Captain Christopher Nesham of the 63rd regiment, and of his wife Mary Williams, who in turn was the sister of William Peere Williams-Freeman who rose to become admiral of the fleet. He was also related to Lord Frederick North, who had served as the Prime Minister during the American War of Independence. On 21 January 1782 Nesham entered the service aboard the Juno 32, Captain James Montagu, which in February went out to the East Indies with Commodore Sir Richard Bickerton’s squadron, and on 20 June 1783 fought at the Battle of Cuddalore. Returning to England in early 1785, Nesham joined the guardship Edgar 74 at Portsmouth commanded by Captain Adam Duncan, and he afterwards served on the Plymouth-based frigate Druid 32, Captain Joseph Ellison, until March 1788. In October 1789, whilst at college in Vernon-Sur-Seine, Normandy, he heroically saved a corn merchant from a lynch mob, for which act he not only received a citizenship from the town, but was also invited to Paris by the Revolutionary authorities where he was presented with a uniform sword of the National Guard and had a civic crown placed on his head. In June 1790 he joined the Salisbury 50, flagship on the Newfoundland station of Vice-Admiral Mark Milbanke and captained by Edward Pellew. Being promoted lieutenant on 17 November 1790, he saw further employment in the Channel aboard the sloop Drake, Captain John Doling, and with Captains Richard Keats and Robert Moorsom aboard the frigate Niger 32. On 11 May 1793 Nesham joined the Adamant 50, Captain William Bentinck, serving under this officer and Captains Henry d’Esterre Darby, Henry Warre and William Hotham in the West Indies, Newfoundland and in home waters. During 1797 he was the first lieutenant of the Adamant to Captain Hotham, flying the flag of Vice-Admiral Richard Onslow and remaining loyal during the North Sea mutiny which broke out on 12 May. He subsequently fought at the Battle of Camperdown on 11 October. On 2 January 1798 he was promoted commander, but it was not until 13 April 1801 that he was given a commission, this being to the French-built sloop Suffisante 14 in place of the indisposed Commander Josiah Wittman. Cruising off the French coast unless forced into Plymouth by rough weather, the Suffisante later sailed for Ireland in April 1802, on the 29th of which month Nesham was posted captain in a general promotion. His command was paid off on 3 July. He was not immediately re-employed when war recommenced in 1803, but from 26 October 1804 until February 1805 he was the acting flag-captain aboard the Foudroyant 80 in the Bay of Biscay to his distant relative by marriage, Rear-Admiral Sir Thomas Graves. Unfortunately Graves’ squadron was off station when Rear-Admiral Missiessy’s ships broke out on 11 January 1805, and the Frenchman was able to enjoy a destructive four-month cruise in the Americas. In March 1807 Nesham recommissioned the Ulysses 44 at Portsmouth, taking a convoy out to the West Indies in August, and in March 1808 he served at the reduction of Marie Golante. 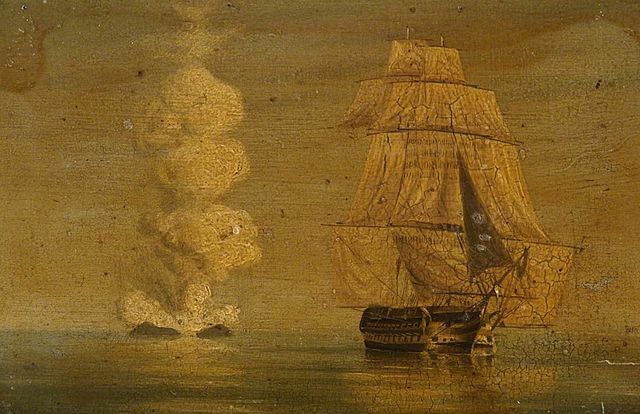 On 6 July he transferred to the Intrepid 64, and he was present at the capture of Martinique on 24 February 1809, where he led a naval force ashore in moving cannon to the heights of Mount Sourier under testing conditions. The Intrepid subsequently suffered at the canon of Fort Mathilde, Guadeloupe, on 15 April whilst unsuccessfully attacking two French frigates, the Félicité 36, and another named as the Henriade, but which was possibly the Furieuse 40. On 21 July Nesham transferred to the Captain 74, retuning to England in December to be paid off when this ship was deemed unfit for further service. For the remainder of the war Nesham remained on half pay, and he was not re-employed until July 1830 when he took command of the Melville 74 in the Mediterranean. In the following summer orders were sent out overland for her to return to England, some fifteen months before her commission was due to expire, and she was paid off shortly after arriving at Portsmouth in September from Malta. In October Nesham was appointed to the Revenge 74, destined for the Mediterranean, but he appears not to have taken up the command. He joined the retired list on 10 January 1837, was re-instated with the rank of rear-admiral on 17 August 1840, became a vice-admiral on 9 November 1846, and retired again upon being promoted admiral on 30 July 1852. Nesham died on 4 November 1853 at Exmouth, where he had lived for some twenty years. In November 1802 at Anthony Church, Cornwall, he married his cousin, Hon. Margaret Anne Graves, youngest daughter of the late Admiral Lord Thomas Graves, but sadly she died half a dozen years later in 1808. On 1 July 1833 at Sidmouth he married Elizabeth Bayly, the youngest daughter of the late Colonel Nicholas Bayly and niece of the 1st Earl of Uxbridge. He had a son and a daughter from his first marriage and issue from his second marriage.